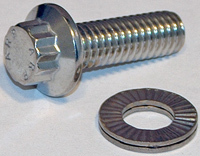 The locking header bolts are vibration proof, heat resistant, and they are easy to use. No special tools required for installation. The locking header bolts are vibration proof, heat resistant, and they are easy to use. These are made with a 5/16'' wrench head for applications that require extra clearence. No special tools required for installation. The locking header bolts are vibration proof, heat resistant, and they are easy to use. These are made in extended length for thicker header flanges. No special tools required for installation. The locking header bolts are vibration proof, heat resistant, and they are easy to use. These are made for small block Mopar. **Note The washers come separate not installed on the bolts. ** No special tools required for installation. The locking header bolts are vibration proof, heat resistant, and they are easy to use. These are made for Mopar V10. **Note The washers come separate not installed on the bolts. ** No special tools required for installation. The locking header bolts are vibration proof, heat resistant, and they are easy to use. Fits some LS engines. 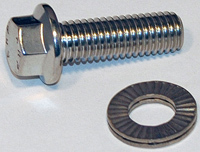 **Note The washers come separate not installed on the bolts. ** No special tools required for installation. The locking header bolts are vibration proof, heat resistant, and they are easy to use. Fits some LS and Ford modular engines. **Note The washers come separate not installed on the bolts. ** No special tools required for installation. The locking header bolts are vibration proof, heat resistant, and they are easy to use. Fits new Hemis. **Note The washers come separate not installed on the bolts. ** No special tools required for installation. The locking header bolts are vibration proof, heat resistant, and they are easy to use. Fits Ford V10 **Note The washers come separate not installed on the bolts. ** No special tools required for installation.